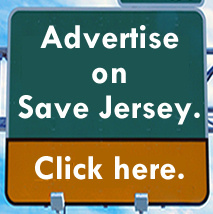 MLK Day is here again, Save Jerseyans. Lots of memes and quotes are flying about but not much substantive discussion of WHO this man really was, and how the slain civil rights icon’s remarkable life story fits into today’s consequential policy and societal debates, is taking place on the news/Twitter/in classrooms today. There’s some misinformation afoot, too. Political manipulation of course. #FakeNews abounds. #1 – Martin Luther King, Jr. definitely wasn’t “conservative” but sure as hell wasn’t a Democrat. Like most historical figures? MLK was a complex man. 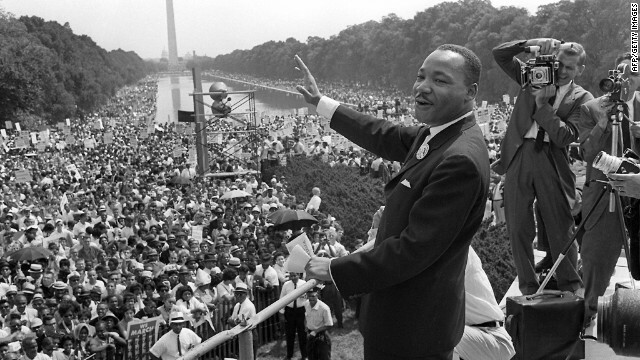 One of undeniably great courage and conviction, he brought the civil rights movement into the forefront of the American consciousness at a tipping point in the battle of legal equality. The Reverend was also a radical leftist on the economic front and, at least the JFK-era FBI contended, an allegedly less-than-loyal husband. Snopes (which is sometimes too biased to be effective) has a balanced discussion of the MLK sexual allegations here. I’m far more concerned with the economic angle; he was very similar to Gandhi (whose teachings visited a lot of economic harm on the Indians he was trying to help): a man possessing great ideals but who espoused a less-than-great execution of those ideals. So I doubt that, then as now, King would’ve felt entirely at home in EITHER party in 2019. Republicans can’t claim him any more than the Democrats can (despite what they’d lead you to believe), a poignant point of reflection as Democrat-dominated California moves to allow Communists to hold state office. 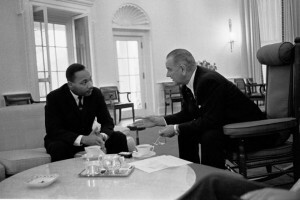 Martin Luther King Jr. and LBJ meeting in the Oval Office. #2 – Black Americans have suffered terribly at the hand of Leftist policies, some of which MLK supported. 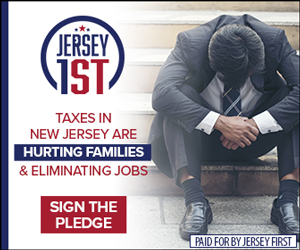 Modern American politics could certainly benefit from MLK’s moral example, but as I started to explain above, Save Jerseyans, his economic policies weren’t as admirable as his civil rights legacy. 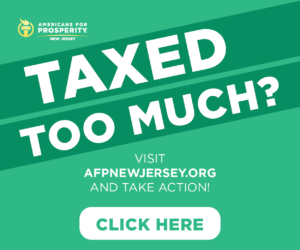 What’s undeniable: Black America might be a lot better off today at Richard Nixon defeated JFK in 1960 (or if JFK — an adherent to supply side economics) had not suffered the same awful fate as Dr. King. 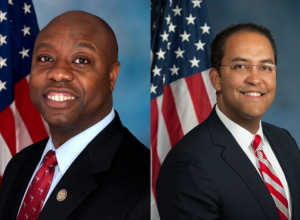 #3 – Yes, there are black Republicans. The irony is as rich as it is sad given that the GOP (1) freed the slaves and (2) helped Lyndon Johnson get civil rights past a hostile Democrat Congress. It can be argued that the single greatest force holding back black America today is black voters’ unflinching fealty to the Democrat Party which, in turn, has allowed Democrats to take them for granted and turn a blind eye to the criminally-bad consequences of Leftist policies in our urban and rural communities. #4 – President Trump’s approval rating with black voters is stronger than many know. Maybe things are starting to change. Rasmussen Reports found Donald Trump with a 40% approval rating right before Halloween 2018. Among overall voters? Nope. Black voters. Keep in mind: Rasmussen came CLOSER than anyone to predicting Trump’s actual 2016 margin (his last poll stood at Clinton +2, and Hilldawg won the national vote by 2.1-points). The charisma of FDR and the Kennedy brothers helped move black voters in the Democrat column. Maybe the Trumpster is starting a trend. TBD. #5 – Black unemployment is hitting historic lows under President Trump. He’s earning their support with results. Last spring? Black unemployment hit its lowest level since 1972 – when Richard Nixon was president. Far more Americans of all ethnic backgrounds are working today than under our social justice warrior president Barack Obama thanks to President Trump’s pro-growth, pro-business, pro-tax cut, anti-regulation policies. The recent criminal justice reform legislation was also championed by President Trump; Barack Obama failed to pass any such measure during his eight years in office (including the first two when his party had control of Congress).